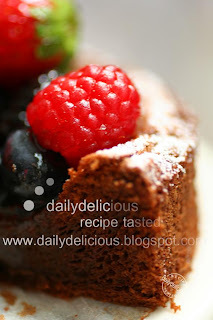 dailydelicious: Fallen chocolate cake with fresh berries: Jewel on the chocolate cake! 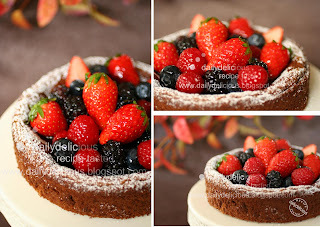 Fallen chocolate cake with fresh berries: Jewel on the chocolate cake! There are a lot of books which I really wanted to have as soon as they released, but after that I didn't try any recipe from them. My sister had to run to the bookstore to buy it for me because I really need it (haha, well, I told her that she had to do it). And now almost 3 years, I just pick it up and actually try one recipe, ^ ^. 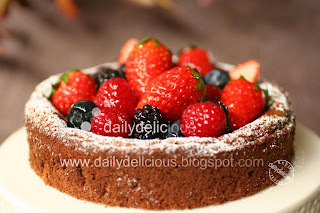 I choose the one that shown on the cover of the book the Fallen chocolate cake, a good looking cake that really easy to make, because it's really meant to be fallen ^ ^, you don't have to try to fold the cake with the fear that it will be too much and you will get the flat cake. The cake will rise up high and yes fallen beautifully when cool. 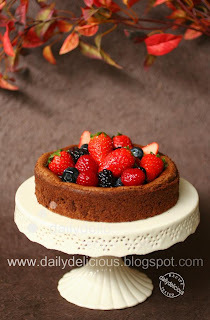 The brown cake contrasts with bright color of the mixed berried make them look like a little jewel (or you can use use one kind of berry, like raspberry, strawberry, blackberry or blueberry, it will delicious anyway.) The taste of the chocolate is a good companion to the taste of the berry and when come with a good cup of tea or coffee, well, you can imagine by yourself haha. I know that my cake look a bit like a sponge cake, ^ ^", and don't have a good looking crack on top of the cake, because I fold the egg white with very light hand (my habit). So if your cake top is cracking than mine don't worried, you did it right, ^ ^. I make only 1/3 of the original recipe, but if you want to make a bigger cake, just triple the amount of the ingredients and bake the cake in 10 inches round cake pan for 60 minutes. Jewel on the chocolate cake ! Position a rack in the center of your oven. Preheat the oven to 350°F. Grease a 6-inch springform pan with nonstick vegetable cooking spray or butter. Line the bottom with a parchment paper round. 1. In the top of a double boiler set over simmering, not boiling, water, melt the chocolate with the butter, stirring until smooth. 2. 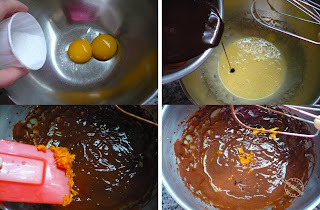 In the bowl, whip the egg yolks with half of the sugar until doubled in volume. Add the melted chocolate and mix until combined. Add the zest and Grand Marnier and mix until combined. 3. In the clean bowl of the electric mixer, fitted with the clean whip attachment, make a meringue by whipping the egg whites until foamy. In a slow steady stream, add the remaining sugar. Whip until the whites hold stiff but not dry peaks. 4. 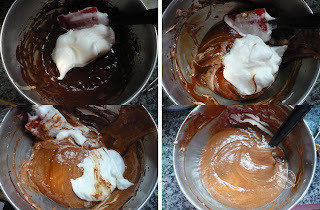 Briskly fold one-third of the meringue into the chocolate mixture to lighten the batter. Gently fold the remaining two-thirds of the meringue into the batter until it is just incorporated. 5. Pour the batter into the prepared springform pan. Spin the pan to level the batter. Bake for 45-50 minutes, or until a wooden skewer inserted into the center comes out clean. The cake will fall as it cools. round. 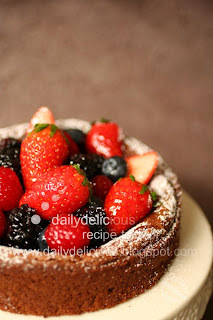 Turn right side up onto a serving plate and dust with confectioners’ sugar. Heat the apricot preserves in a small saucepan over medium heat until liquid. Remove from heat and strain the jam through a fine strainer to remove any fruit lumps. 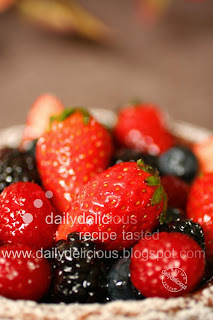 Brush the berries with the apricot glaze and serve. Thanks for sharing this. I made this over the weekend, and it was both delicious and spectacularly beautiful with all the berries glistening. I made this for a friend's birthday, and she loved it. Wooooooow, I'm really happy that you love it. can i know how much apricot jam do i need to make the glaze? Really sorry that I didn't measure it ^^". Hi can I know where I can get Grand Marnier (or any other orange liquer)? Is it ok to miss this ingredient out? You can buy it from supermarket (in the liqueur corner), but it's ok to omit it too. You can keep it at room temperature ^^. 7cm is very small, did you pour all the batter into 1 pan? As the recipe above uses 15cm (6inch) pan. 7inch pan will need 1.5 batch of the batter ^^, so the batter is too little for the pan. You will need 2.5 batch of the batter for 9 inch pan. If I want to make in 8 inch..what is the right.measurement? You will need to double the recipe for 8inch pan.